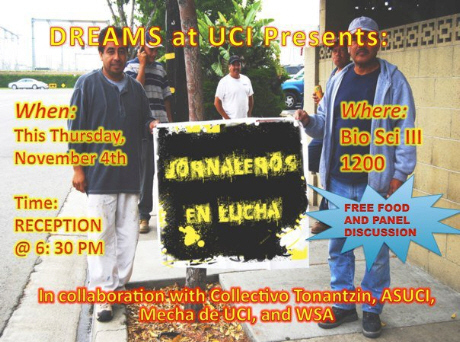 Free screening of the new documentary, Jornaleros en La Lucha (Part 1) tonight at UCI, at Bio Sci III, 1200, at 7 pm. FREE MOVIE AND FOOD. Absolutely free! Enjoyment is priceless. In the context of the passing of SB1070 in Arizona and other anti-migrant laws in cities throughout the nation such as Costa Mesa, and the student struggle for the Dream Act as a Stand Alone Bill, Jornaleros en Lucha (Part One) is a documentary that depicts the struggle of day laborers in the cities of Orange and Costa Mesa located in Orange County. The film documents the obstacles and struggles of day laborers as they try to organize into a collective in order to fight anti-day laborer ordinances in these cities and establish safe-corners or sites where they can congregate and provide their labor without fearing police harassment. WILL THEY BE SHOWING THE STRUGGLES OF THE TAX PAYERS THAT HAVE TO PUT UP WITH . 1 . BEING ILLEGAL IMMIGRANTS NOT IMMIGRANTS , 2. THE COST OF ALL THEIR HEALTH CARE US TAX PAYERS HAVE TO PAY .